Access Agriculture is a group of passionate people (including governing board and advisory group) devoted to promoting effective agricultural training videos for the benefit of farmers and rural businesses. To develop local language versions, mass multiply and disseminate agricultural training videos, Access Agriculture collaborates with more than 200 communication professionals across the globe. To be a global leader enabling south-south exchange of and access to quality audio-visual training materials to secure sustainable livelihoods of smallholder farmers and users of natural resources. To facilitate and build capacity for the production and translation of quality farmer-to-farmer training videos into local languages. To improve access of youth, women, smallholder and marginalised farmers and users of natural resources to relevant knowledge through networks, partnerships, appropriate information and communication technologies and feedback mechanisms. To help improve rural advisory services and agricultural education systems, help them value farmers’ knowledge and innovations, and encourage joint learning on sustainable agriculture and natural resource management. Access Agriculture is a platform for agricultural Research and Development (R&D) staff, service providers, extension agents, communication professionals and representatives of farmer organisations to see what training videos are available and request new language versions.The videos are all designed to support sustainable agriculture in developing countries. For maximum impact in improving opportunities for farmers explore Access Agriculture video distributed into 14 Access Agriculture categories. From the Access Agriculture categories you can find and download videos and audio files, and for most videos, related written material. Downloads are free, but you will have to register and provide your contact details. Any local language version available for a particular video is listed and can be downloaded. 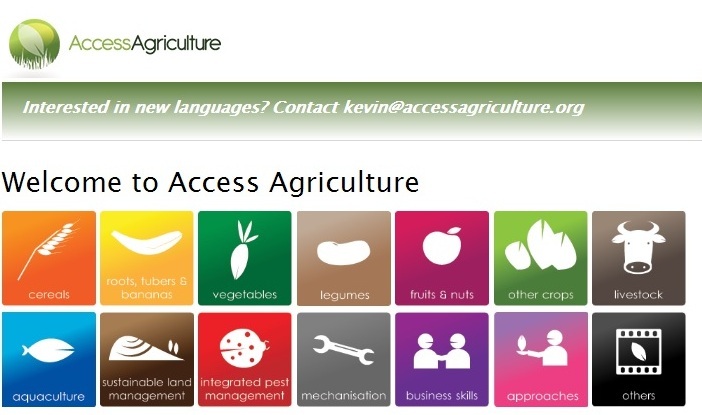 You can contact Access Agriculture for translations into other local languages that are not yet listed. P.S. "...this is the best and largest online agriculture training video library that is in many languages, and we have had great impact in our agriculture work using these videos”, - Sean Granville-Ross, Country Director, Mercy Corps Uganda.